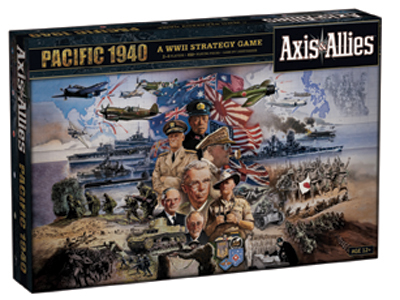 Axis & Allies Pacific 1940 will feature an oversized board that measures 35â€� wide by 32â€� high. With over 450 pieces, deluxe game components and local storage boxes, this game will raise the standard established by A&A Anniversary Edition. All new rules for neutral nations, naval & air bases, kamikaze attacks and convoy disruption will add even more depth and historical accuracy to this giant game.